Really Rocket Science » Blog Archive » Laptop Go Boom! 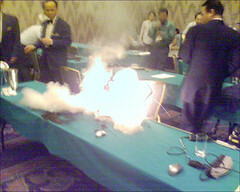 AN INQUIRER READER attending a conference in Japan was sat just feet away from a laptop computer that suddenly exploded into flames, in what could have been a deadly accident. Gaston, our astonished reader reports: "The damn thing was on fire and produced several explosions for more than five minutes"…. "It is only a matter of time until such an incident breaks out on a plane," he suggests. Our witness managed to catch all the action in these amazing pictures. "Fire extinguishers leave a mess on your suit and belongings; pack your stuff (if you can) and leave, leave, leave!" he advises. We don’t have any further details of the model of the computer in question. In light of the evidence, however, we’d suggest you avoid actually using a laptop on your lap. This entry was posted on Tuesday, June 27th, 2006 at 6:49 am	and is filed under Cool Stuff. You can follow any responses to this entry through the RSS 2.0 feed. You can leave a response, or trackback from your own site.